Data retrieved from a 2013 report from the National Center for Transgender Equality. “But I haven’t been able to use my degree because the positions I’ve interviewed for always end up filled by someone else,” said Frasier, 27, who drives for Uber in Lansing. Frasier thinks a key reason she hasn’t been hired is because she’s transgender. 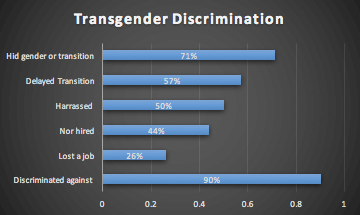 At least one in five transgender people surveyed in studies between 1996 and 2006 report experiencing employment discrimination, including being fired, denied a promotion or harassed, according to the Human Rights Campaign. The advocacy group also says transgender also face barriers as job applicants. Even if a transgender person doesn’t opening disclose their biological gender, there are legal ways potential employers can find out. Legal background checks often will find previous names or a different gender identity. “Employers are hesitant to hire transgender people because they don’t fit into the neat categories of man and woman, which is harder for some people to grasp,” said Erich Pitcher, an associate director of research and communication with the Office of Diversity & Cultural Engagement at Oregon State University. Those who are employed have a low income, according to a socioeconomic study by the American Psychological Association. The study states that 64 percent of transgender people reported salaries below $25,000 a year. Frasier said she made about $18,000 last year when she worked as a full-time cashier at Lansing pharmacy. She’s also worked as a telemarketer and a janitor. Lexie Riddle, a 32-year-old trans woman from Jackson, Michigan, said that she has found it easier to get hired since she’s transitioned. Riddle said she is hoping to work in health care, as she is pursuing her master’s degree in health care leadership. Formerly, she made about $12,000 a year working part-time at the Jackson College financial aid office, where she stayed for six years. Corporate hiring policies can unintentionally create systems that are discriminatory, Pitcher said, and the systems aren’t structured in ways that allow these problems to be easily challenged. “Nobody’s saying directly let’s pay this person less because they’re trans or because they’re a woman or because they’re black,” he said. Pitcher, who has doctorate in Higher, Adult and Lifelong Education from Michigan State University, said when he was working on his dissertation, he talked to a person employed in higher education who had begun opening transitioning gender. However, it doesn’t always end that way. Ed and Naiah Holsey walked into her sister’s engagement party, hoping no one would make a scene about them being hand-in-hand. “Why didn’t you come alone?” her sister asked.